Plenum-rated metal chassis and integrated 802.3af Power over Ethernet for safe deployment in any indoor application. Designed to support small to medium business or enterprise environments by providing network administrators with secure and manageable dual-band wireless LAN options. 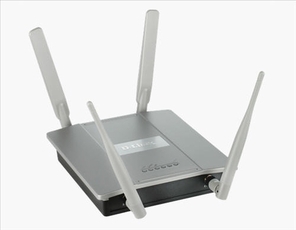 Four detachable antennas provide optimal wireless coverage in both the 2.4GHz (802.11g and 802.11n) and the 5GHz (802.11a and 802.11n) bands. Enclosed in a rugged, plenum-rated metal chassis, adheres to strict fire codes in air passageways.